The 2016 Space Coast Birding and Wildlife Festival is over, and it’s time to face the post festival let-down and adjust back to “real life.” I also came down with a severe cold (luckily after the festival!). My apologies for the delay in getting this blog post up. I had a packed schedule this year. Since I’d had so much fun on the night hikes last year and the year before, I signed up for one each night of the festival. This was great, in theory, but in practice it meant being sleep-deprived for much of the festival. This was Camille’s first festival, so she basically mirrored my schedule. The weather was quite variable and temperamental all week, and due to a much wetter than average fall and winter, many of the sites had standing water or deep mud that would have otherwise been dry. That made for some fun challenges in getting around the trip sites, but we managed. I’ll summarize each day/trip here with a few photographs. I had my camera with me most of the time, but with my focus on FOY and life birds, and with some days being rainy and windy, photography was not a great priority for me. Could you steer us to the birds? Most of our trip was along the Brickyard Slough Tract – a sort of side extension of the St. Johns River – and the ranchlands adjacent to some wetlands and some wooded tracts. In the comparatively drier “upland” grassy areas we saw and heard my FOY Sedge Wrens and had some great fly-bys of Pileated Woodpeckers. Much of the typical habitat we slogged through. Unfortunately, recent rains (and a wet fall and winter) made much of our going very muddy and difficult to walk through. Our ultimate goal was to make it to Bench Ranch Park, but the going was so difficult that we had to turn back the way we came (no easy feat in itself), and get driven out via park service trucks. Camille almost lost a rubber boot, and one of our trip leaders lost both his shoes twice to the muck. Other notable bird sightings included a dark morph Red-tailed Hawk, something I’ve never seen before, a pair of Northern Harriers, and a couple of American Kestrels. Chip Clouse, another trip leader, provided the base eBird list for us, linked below. The evening trip for Day 1 was a bus ride/walk along Hatbill Road [map] with Mitchell Harris. The night was a little cool, and we had a cold day previously, but Mitchell was hopeful the owls would be active and responsive to us. He birds the area frequently and has an intimate knowledge of the owl (and other crepuscular/nocturnal birds) species. At the start of the trip, just after sundown, we played some rail calls near a marsh along the St. Johns River at Hatbill Park. We got some clear replies to both King Rail and Virginia Rail calls! The Virginia Rail calls were a lifer ID for me, but this would be put in a different context later in the week. We had some good call-backs from the Eastern Screech Owl calls he played, but no response at all from the Barred or Great Horned Owls he knows to be there. We were about to finish the trip, at our last stop, when we finally got a Eastern Screech Owl to come out and let us spotlight it. This is the first time I’ve actually seen a screech owl in the wild. All my previous IDs are voice only! Camille, a fellow owl-phile, was excited as well, and we did a celebratory fist-bump. That one sighting made the whole trip worth it! The second day of field trips started off cool again, and off-an-on rain showers made the birding a challenge. I’d been urged by my friend Sean Reynolds for years to visit the Tosohatchee Wildlife Management Area [map], so I made it a priority to do both Tosohatchee trips this year. The park is spectacularly beautiful! We followed a powerline cut at sunrise, and we got out a few times to see the birds waking up. We were treated to an extended look at a King Rail at the edge of some brushy wetlands, and a great look at a Barred Owl perched in the open after sunrise. We stopped at a bend in the St. Johns River where a small flock of wintering warblers were feeding. We then made our way into the WMA and the various habitats it maintains. Birding in the rain is difficult and limiting. I didn’t dare have my camera out for most of the time, and keeping my binoculars clear was distracting. Fortunately, many of the birds obliged by being very visible, even to the unaided eyes. We had great looks at Bald Eagles, Purple Gallinules, various woodpecker species, and Blue-Gray Gnatcatchers near Lake Charlie (see photo, above). A male (note the red cap) Yellow-bellied Sapsucker having breakfast at Tosohatchee WMA. We generated momentum throughout the day and managed a decent list, despite the weather, and got some good looks at a few of the birds not afraid to brave the intermittent downpours and wind gusts. But there weren’t many large flocks of winter residents hanging around. Part of a large flock of birders. The second night-hike of the festival was at Fox Lake Park [map]. I had done this trip last year, and it had been so much fun, I was very keen to try again. On the whole, the trip was quite fun, and we managed to call in a Barred Owl pair and get some good looks at them. My main complaints would be that some of the trip leaders got to talking and gossiping to the point that they were not interpreting the trail or paying close attention to the group behind them. Xavier (whom was a trip leader last year, as well) did manage to give us some good information on the park and its management practices, though. The start of the second Tosohatchee trip followed along the powerlines again and down to the St. Johns River. We stopped along the same stretch as the previous day’s trip, listening again for rails and watching as the birds woke up. We heard some King Rails again, and even had some quick views of Marsh Wrens. The biggest excitement for me was my very first look at a Virginia Rail. Although hearing one on the Hatbill Road trip was great, seeing one was a highlight of my entire birding experiences. It’s strikingly orange bill and gray head were beautiful! We also stopped at the St. Johns river, again. This time, however, we walked along the river to get some better looks at some shorebirds and other activity not visible from the end of the road. One of the park employees who was assisting us got really carried away and excited over hearing some Eastern Meadowlarks (which had been heard the previous morning as well), leading her to keep walking further and further along the river edge, trying to get a look. That sort of energy and happiness is part of what makes birding for some of us so rewarding. A Great Egret braving the chilly rain at the river’s edge. The weather was windier and the threat of heavy rain shadowed us throughout the day, but we managed to miss most of the bad weather as the day wore on. We hiked through some pine flatwoods, catching some warblers and even American Goldfinches, here and there. Drizzly hike through pine flatwoods. Angel, one of our trip leaders (and his wife, Mariel), tried several times to call out a Bachman’s Sparrow after we heard some tell-tale high pitched call notes. Unfortunately, the flatwoods in this part of the WMA were probably too overgrown to attract these birds. Although managed fire does a lot to keep these habitats better suited for most wildlife in central Florida, it’s hard to keep the Saw Palmettos and other brushy plants from quickly out-competing the wire grasses and other cover Bachman’s Sparrows prefer. While birds are, of course, the highlight of these trips for most of us, the festival is meant to highlight wildlife, in general. When we encounter our non-avian friends it is always fun and often educational. Mariel managed to find this little toad on our way along the path. An Oak Toad. This guy is nearly full-grown! I had no idea such a small toad existed in Florida. We emerged at the edge of the woods, back near the powerline cut, and got our first look at some Eastern Bluebirds and a nice flock of Pine Warblers. From there we slogged through some very wet conditions in a cedar dome swamp. The water overtopped my hiking boots, making for a very squishy hike, thereafter. The rains also started to move in, but we still managed to get some reasonable looks at some more birds, ending the day happy, if a little wet. After arriving back at the Eastern Florida State College campus, Camille and I decided to drop by Parrish Park and see if the Long-tailed Duck was there. It had been seen now and again in the weeks leading up to the festival, and some eBird lists had it showing up recently. Two large groups of resting Black Skimmers and a large number of Ring-billed Gulls made up the majority of birds at the park. One of the two flocks of Black Skimmers, having a rest out of the wind. A Ring-billed Gull, walking in the parking area. Note the bright red eye-ring and gape area behind the bill. 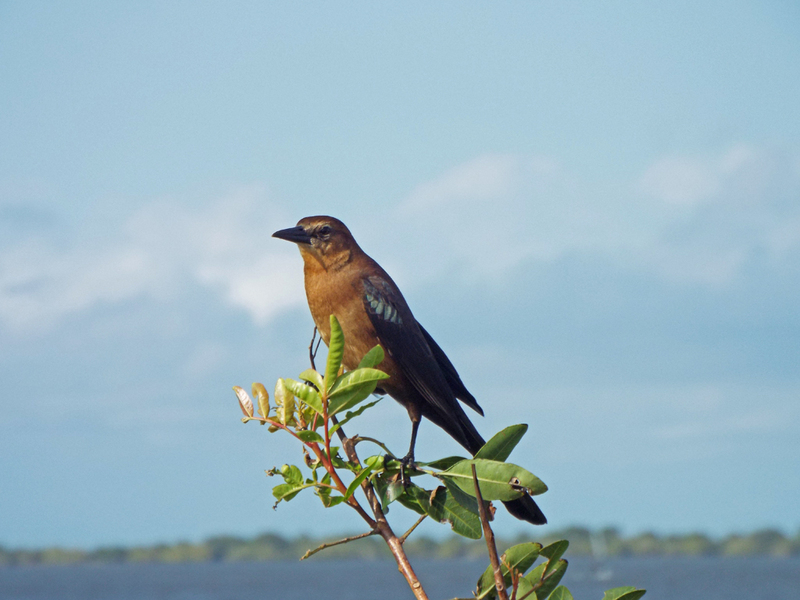 One ubiquitous bird in our area that is found near beaches and parking-lots is the Boat-tailed Grackle. I’ve featured them a few times in this blog, but I tend to gloss over them because they are so pervasive. Here are a couple of shots as they braved the high winds. 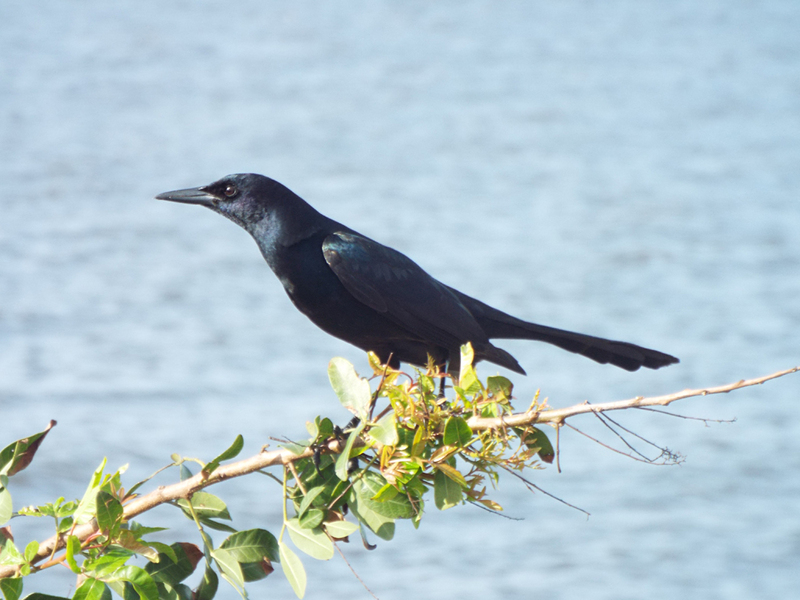 Unlike Common Grackles, where the males and females are quite similar in appearance, Boat-tailed Grackles show much more sexual dimorphism. This is a fancy term meaning the two nominal sexes look different from each other. In this species, the females tend to be a rich brown with darker wings and tails, while the males are larger and an iridescent black. The third night-hike this year was at the Enchanted Forest Sanctuary. It wasn’t as cold this night as previous ones, making for a more comfortable walk in the woods. Like previous years, this trip was educational and fun. We saw various animal tracks, spotlighted hundreds of spider eyes with our individual flashlilghts, and even got both night-vision and spotlighted views of a Southern Flying Squirrel. We called in owls, and managed to get really close to an Eastern Screech Owl that even called as we watched. The trip leaders used red lights to spotlight the wildlife here, which differed from both the Hatbill Road and Fox Lake trips, which both used standard, white flashlights. There is a differeing of philosophy when dealing with nocturnal wildlife, and owls in particular. Some people, including experts such as Mitchell Harris, contend that the bright white lights do little to disturb the owls and as long as we keep a reasonable distance (not specified), there should be no ill effects. At EFS, they use red lights. For many animals (most notably, people), red lights result in little loss of low-light vision because it affects the light-sensitive rods in the retina the least. Whether or not this is true for owls, I don’t know. As I’ll mention again later, some people don’t spotlight wildlife at all. In any case, the night went well and seeing another owl up close was a real treat. That wraps up the first half of my field trips for SCBWF 2016. I’ll summarize the rest, including the much anticipated off-shore (formerly know as pelagic) trip in my next post! Posted on 2016 February 5 2016 February 5 by Lonely BirderPosted in Birding, SCBWFTagged Birding, birds, birdwatching, SCBWF, Space Coast Birding & Wildlife Festival.